A rainy Sunday with the aroma of slow-roasting pork, music, and a glass of wine…lovely. In a small bowl, mix together fennel seed, pepper, thyme, rosemary, garlic, salt and olive oil. Rub the mixture evenly over the pork shoulder. Put it into a zip-lock plastic bag, making sure that the seasonings cover the pork all over. Marinate overnight for maximum flavour (or early in the day, as I did because I forgot to do it earlier, but it was still flavourful). Preheat oven to 450ºF. 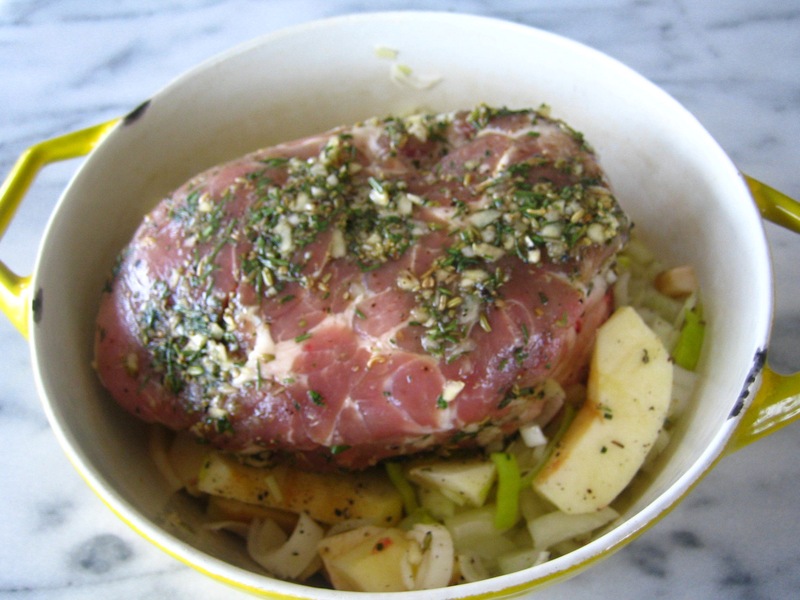 Place apples, onions and leek in a heavy, covered oven dish and lay pork on top. Roast, uncovered, for 30 minutes. Turn oven heat down to 325ºF and add liquid. Cover, and slow roast for 3 hours, or until meat falls apart. Remove from oven and mix the meat, onions and apples all together. This is not a beautiful-looking company meal, but it is delicious served with baked sweet potatoes and asparagus. Serves 4-6. Made this pork dish for my family tonight and they said it was the “best pork entree” that have ever had! Would definitely make it again. It is easy and different and I mixed the apples, leeks and onions all together after cooking and served it on the side with the pork. K.H.